I have been a bit off-kilter this past week. Two weeks of school vacation can do that, I suppose. We have not found our rhythm yet but we are getting there. I have been writing down goals and preparing for the weeks ahead! So, I am hoping for a fun (and mildly organized) July and August! It has been ridiculously rainy this past week so we haven't been out to water the vegetable garden. We were surprised to see how big our plants have grown!! 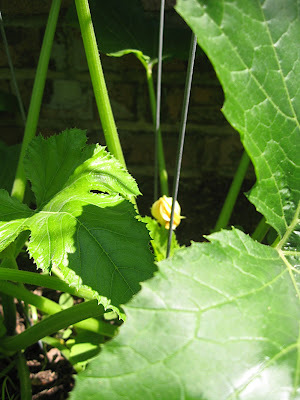 We will be keeping a close eye on these yellow flowers that will sprout zucchini soon! We have tomatoes and cucumbers, also! Yum! 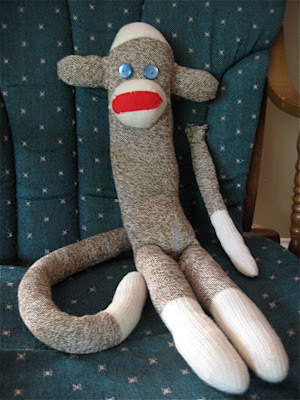 My poor sock monkey is need of some serious repair after all the love the twins have been giving him lately. Once I send the girls' on a treasure hunt for his other arm, I hope to stitch him as close to new as possible. However, considering my hand-sewing skills, he may not stay fixed for long. Yogurt smoothie anyone? This is a staple in our house during the summertime! Today, with a desperate need of a trip to the grocery store, I threw in whatever remained in our refrigerator. 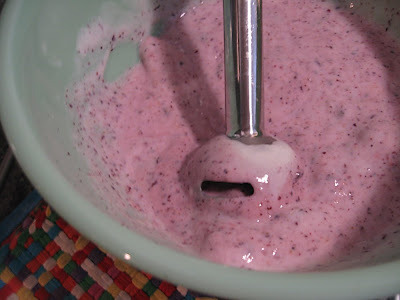 -One 32 oz container of low-fat vanilla yogurt, about 1/2 cup frozen blueberries and 1 cup of frozen peaches, blend and serve! *We used both organic yogurt and frozen fruit. *Tip* If you are searching for organic fruits, buying them frozen can be less costly per pound and perfect for making frozen yogurt smoothies or milkshakes! 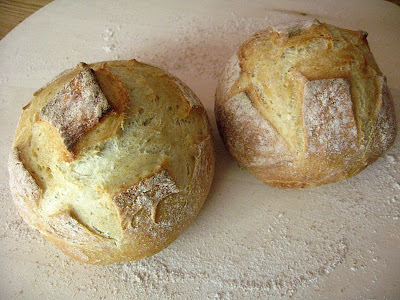 I also want to bake more of this delectable bread this week! This was my first attempt using the Master Recipe from the book, Artisan Bread in Five Minutes a Day: The Discovery That Revolutionizes Home Baking, that I stole borrowed from my mom! This bread is too good! I have become hopelessly addicted to this delicious sourdough bread and I am not sure I can (or want to) be saved! The Master Recipe makes 4 loaves each time you make it and it stores wonderfully in the refrigerator in a lidded container until you are ready to bake. I was "ready to bake" every day this past week and I went through 4 loaves of the free-form loaves pictured above, 2 baguettes and I gifted two loaves of Ciabatta to my Mom. You can read more about this book over at Baker's Banter, a blog by King Arthur Flour. Oh, and if you are looking for another perfect bread to bake, this has been a "no-fail" recipe for us: *Harvest Grains Bread*. I was also inspired to revamp our Summer Wish List from a post I read on The Inspired Room. I plan to make something more creative (than our current one) with glittery stickers to mark our progress! And, if it involves glitter...it's sure to be great! Right? I hope to post our new and improved list later this week! That smoothie looks so good! We've been making them a lot lately too. I just ordered some popsicle molds for frozen smoothies that the littles are eagerly awaiting. Your bread came out beautifully. We tried the light wheat this wheat and it's wonderful as well.